SuperEnalotto – The Godfather of Lotto Draws! The Italians love their lottery, and the reason is plain to see. With three weekly draws plus no cap on rollovers the Italian SuperEnalotto jackpots grow quickly to become some of the biggest in the world. Your price to win these colossal jackpots? Just £2 a bet - now that's an offer you can't refuse! SuperEnaLotto jackpots regularly boasts massive jackpots. The current record £125 million won in 2010. To win the jackpot you must match all six main numbers. SuperEnalotto also includes a 'Jolly Number', which is similar to a bonus ball, and is used to decide the winner of the second prize division. The advantage of having three draws a week as opposed to two is the fact that the jackpot grows 50% faster! SuperEnalotto is drawn every Tuesday, Thursday and Saturday at 8pm CET, or 7pm local time. The SuperEnaLotto jackpot starts at a pretty impressive £1.08 million and then grows without any cap or limit creating the potential for huge wins. No other lottery gives you to the chance to win such big jackpots for such a low price. 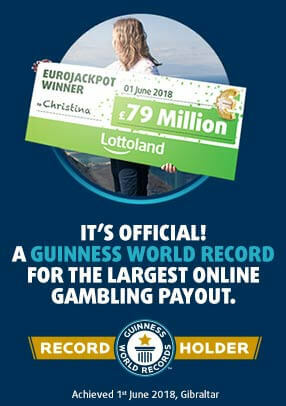 With SuperEnaLotto you can win hundreds of millions of euros having spent just two pounds!